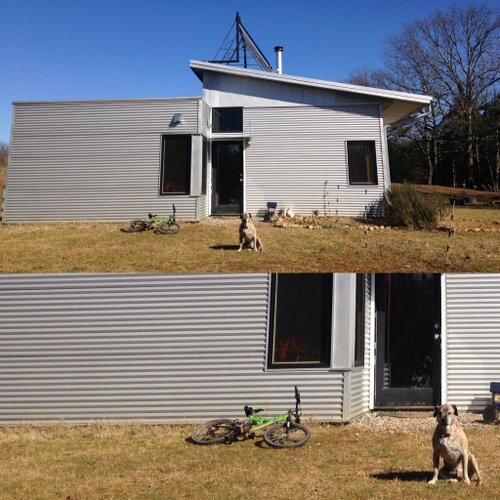 Off Grid Modern Prefab Talks Conscious Vs Easy Off Grid That's Easy. But With More Work. Confusing... But Not. It has been a FRIGID week at the off grid prefab house! But we, of course, inside the energy efficient SIP house, are toasty, often overly so! I also have some prefab project updates in coming weeks, fyi. It has been a learning experience to see the West Coast Dogtrot Mod inch towards fruition with zoning and then contractor procurements... I am hoping to share an actual under construction photos soon! Others also step towards reality. A client meets with the Texas distributor today, but that build date will not be until spring/summer 2017. It will be an interesting spring. But first, let's wrap up winter! 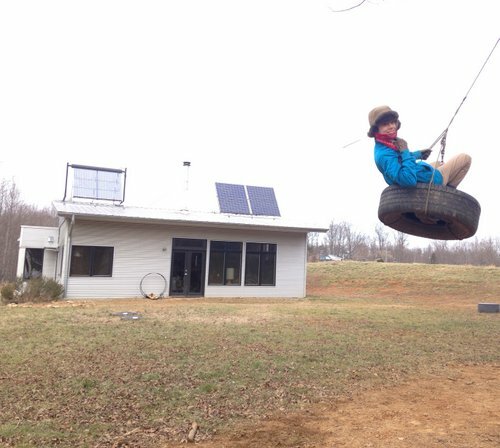 Last week I discussed some of my water concerns, this week, I want to talk about an off grid water JOY! 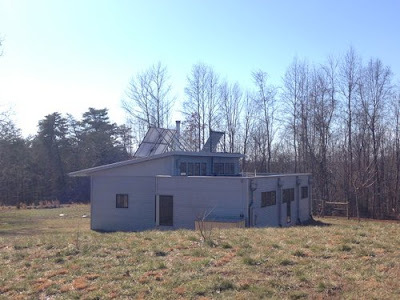 At our modern off grid prefab house, we have solar hot water tubes combined with a tankless water heater to boost the temperature when the solar hot water tubes just can't get hot enough. It works great spring through fall! Water is piping hot! BUT. It wasn't cutting it over winter. When the solar hot water tubes only got to 40, that means the tankless water heater couldn't boost the temperature enough. I really, really, *really* don't want to depend upon fossil fuels, y'know? So in winter I had been quietly limping along with super-quick lukewarm showers. 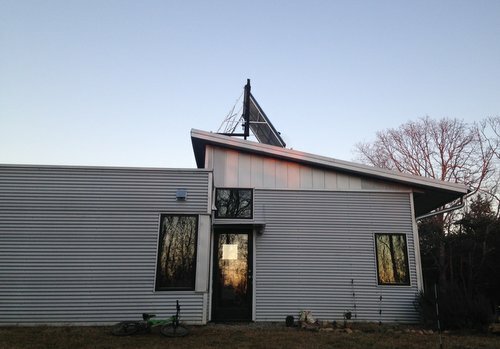 Handsome Husband was dismissive: "Well that's just living off grid." I refuse to accept this! 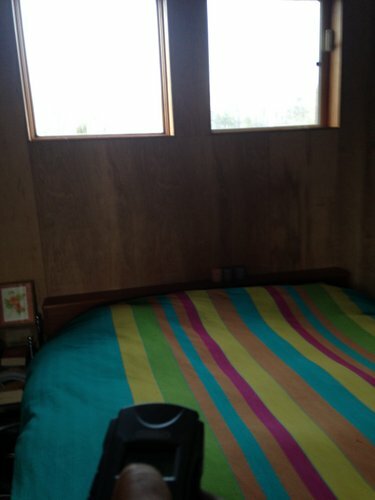 I refuse to accept that off grid should be uncomfortable. I demand a hot shower! He: "Well we'll just have to go to propane, then." Well heck no maybe we won't, mister. MAYBE we can come up with an affordable, independent, better solution. MAYBE we can keep an open mind and find alternative, easy means to heat winter showers. it should be comforting not uncomfortable. Just as I embrace sailing, I embrace the extra, conscious steps that keep my off grid house humming. 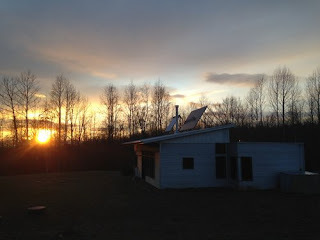 Running pipes from hot water heated via our already-running cookstove (although, if we were starting out fresh and not with an already-poured concrete slab this would be a great solution! 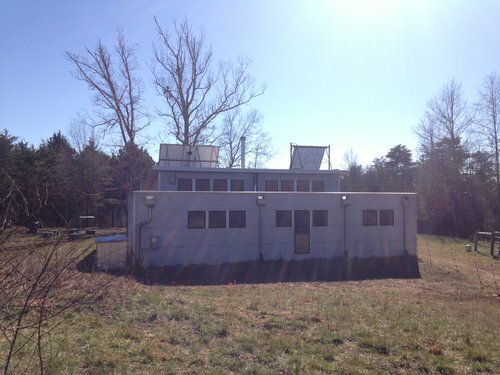 So keep that in mind if you're thinking of building off grid in the future!) was not possible without getting really ugly. 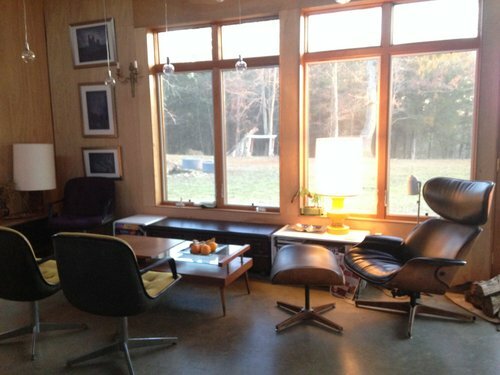 I like good ugly, not clunky bad ugly. 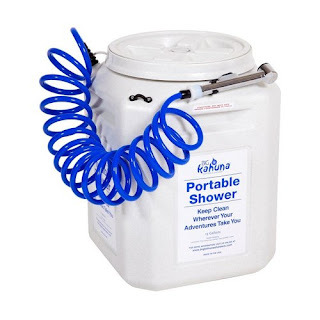 Eventually I discovered, after research, The Big Kahuna Portable Shower. Yes I mentioned that we had received it a few blog posts back. Yes I told you all about it. BUT it was only this week when we actually had time to hook the danged thing up. Ahhhhhhhhhhhhhhhhhh HOT WATER!!!! Hot hot hot water at exactly the temperature I wanted not "eh, this will have do I guess..."! The average shower water consumption is 2-5 gallons per minute! This shower seems to use much less! Yes I take quick showers but not really - I was so happy to have a HOT shower I lingered, yet never used close to the 4 gallons I put in! I'm thinking I used 2-3 gallons, MAX. The shower nozzle it comes with turns off when you're not pushing down the button. We remedied that by attaching it to our "permanent" shower nozzle pipe with a metal band looped around it- so when you pull the nozzle towards you, it frees the button hence turning the water off, when you push the nozzle into the band, it presses down the button and so the water stays on. HOLD YER HORSES! HANDSOME HUSBAND FED IN THE WATER INTO OUR EXISTING PIPES THIS WEEKEND! It works just as whenever you turn on hot and cold water in our shower! HAAAAAAPPY VALENTINE'S DAY! Often it's the most simple things that can give great pleasure. 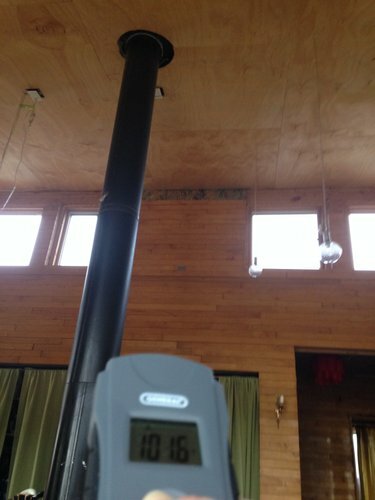 Living off grid, little simple things like building a wood shed or having easy piping hot water for winter showers can, as I mentioned, make a huge difference in our ease and comfort. I see an analogy here. There's a big cultural difference between sailors and boaters. 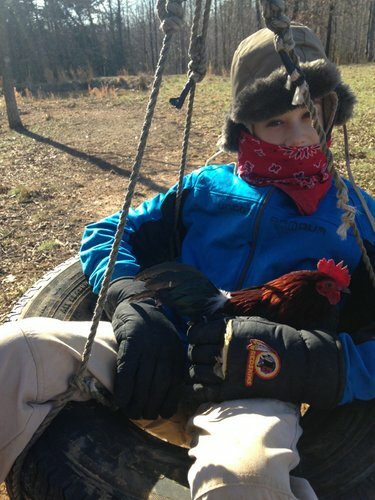 Raised a sailor, I am proud to sail off grid and not be a guzzling spewing burping oily propane boater. And these Pips understand the journey. So, yeah. Don't knock on my off grid winter hot water shower. 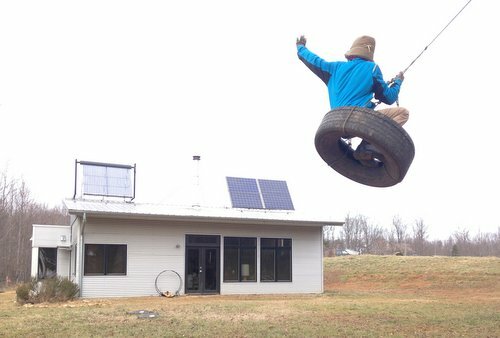 It's efficient, affordable, and works wonderfully. Anyhoo, The Pips, In This Frigid Weather, Were... Outdoors. It was frigid. 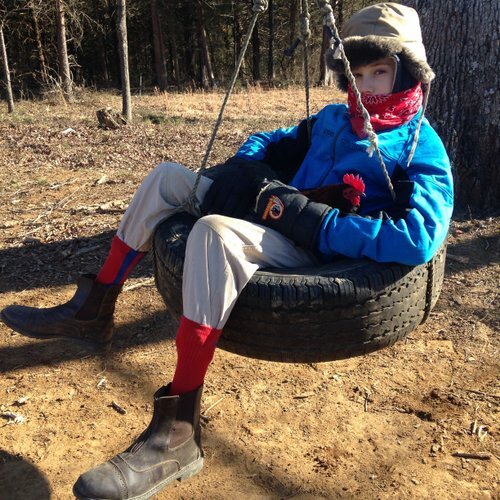 They just donned silk bandanas and tucked in gloves and socks to check the Arctic wind chill. 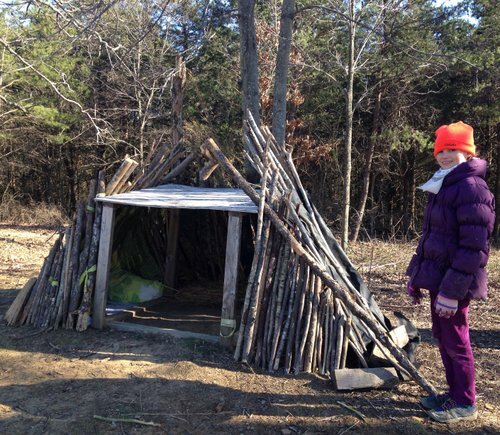 Pip 2 spent the day building this "hotel"and is trying to persuade her brother to be "staff." Future architect? CEO? 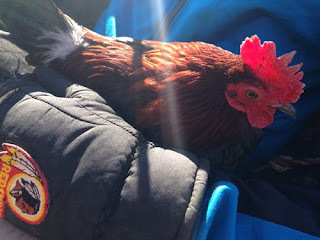 An excellent organizer o' chickens and siblings. 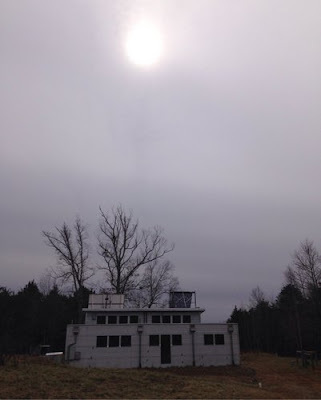 If we weren't so cozy and comfortable in the off grid prefab house, this weather would have been miserable, and certainly dangerous. I just stretched out in my lounge chair with a steaming cup of tea, computer and books within reach, and enjoyed the view. On a "Trip To Town" with some Amish friends earlier this week, we headed to the hardware store where my friend was looking at paint colors to brighten her kitchen. 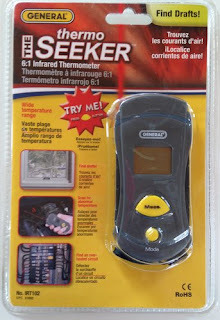 I picked up a pocket infrared thermometer and have been playing with it since! 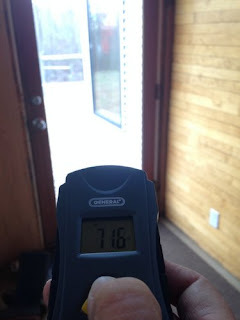 We had a blower door test done when we first built the modern prefab house. But with this inexpensive pocket infrared thermometer, I feel good that I have something I can "spot check" anything I like to confirm it's all still energy efficient and working well. 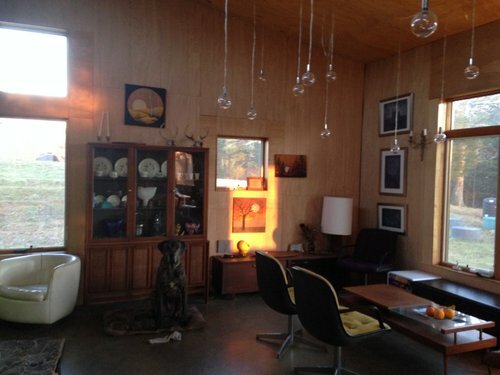 OF THIS PREFAB MODERN HOUSE! 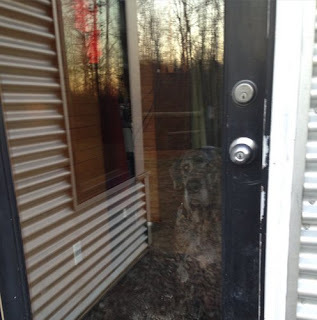 These windows and doors have gotten a lot of wear and tear since we moved in. Need to repaint that door frame in spring! As you suspect, we're ROUGH on everything. So it's a great opportunity to just... spot check... and... shoot laser beams! And continue to shore up this homestead to help comfort, hopefully years down the road, next generations. Here's This Week's Off Grid Farm Project! Ice In The Livestock Trough! Oh, geez. Not working so well. for a cool equine experiment! I have been trying to come up with a remedy to breaking ice so much over winter in the livestock trough. On frigid weeks like this, I am taking a shovel, breaking ice, shoveling it out up to four times a day! 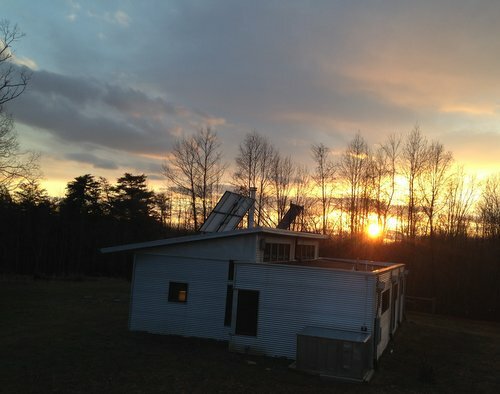 There is a great post on insulated solar water tanks here that I know would work great. but you know what? I already have a loooooong list of projects and just don't want to take this one on right now. So I tried the salt-water-in-a-milk-jug thingamabob. It was disastrous. Although she disdainfully left the small soda bottle alone, my playful, curious horse picked out the milk jug each day. Lids were dispatched with, leaving beheaded jugs, and often stomped, for good measure. 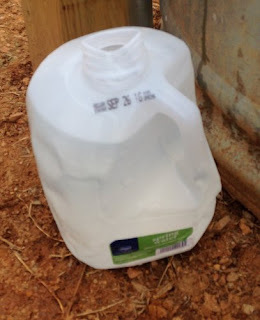 My friend C., fyi for those that have equines, opined that the reason the milk jugs were getting taken out and not the small soda bottle was because she could get a grip on them vs. small soda bottles we picked up along the road (yeah! cleaning up the road for reuse!) were more like "bobbing for apples" and she didn't want to submerge to get them. BUT I HAVE SOME TRICKS TO PLAY BACK ON THAT HORSE! I got a new huge juice jug and another small soda bottle to add with the original one, but this time upended the bottles. Come evening the temperatures dipped into the teens. We awoke to SNOW. EVERYWHERE. 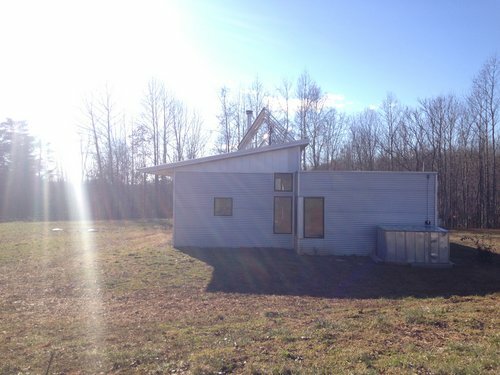 On the right: Cozy warm off grid prefab house! On the left: Equines goin', "WHATCHOO DOIN'???" But in the water, WITH NO ICE covered with just a layer of slush from the snow, bobbed two soda bottles. No juice jug?!? But: two soda bottles bobbing in ice-free water. My horse and I both won. "While getting outdoors is good for our physical and mental health, parks also contribute to a community’s economic health." Should It Take More Than Kindness To Get Into College? 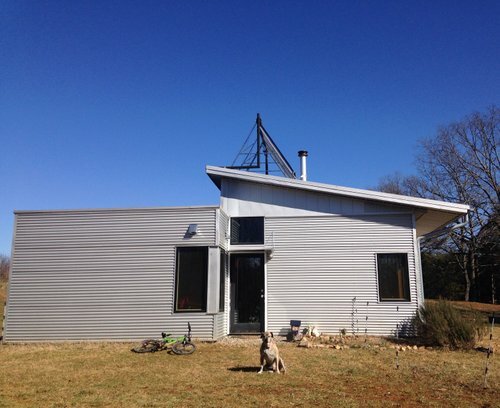 We'd love to see some floorpans of the West Coast Dogtrot Mod!